In 2007, we were approached by a group of people with physical disabilities in the southern town of Rosso. With no government support and limited job prospects, many of them were forced to beg in order to support their families. We worked with them to form a local association and set up a workshop for people with physical disabilities where they could learn tailoring, shoe-making, metalwork and other trades. This workshop had a positive impact, both in giving the disabled community a sense of belonging in town affairs and in providing them with a regular income. Later, we organised an appeal to provide wheelchairs to the wider disabled community as mobility in the town is very difficult. 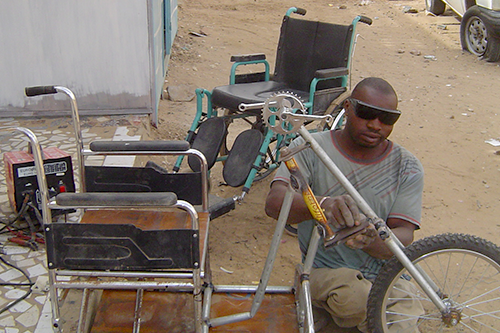 Using their skills, workshop members adapted the wheelchairs to make them more resilient on the muddy streets. The workshop is now funded by the local Mayor’s Office and the disabled community in Rosso has a public voice in local affairs.